You are here: Home / News / What’s Behind That Closed Door? Interior of the Parker Documents Vault at the Wayne County Historical Society. 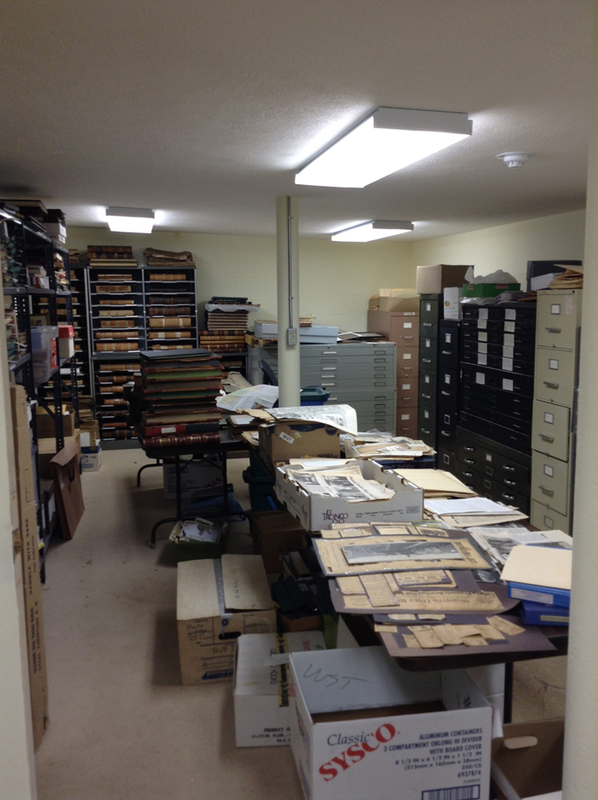 The Wayne County Historical Society’s Ethel Parker Documents Vault is not shown on any tour of the campus or facilities. That’s not because there’s nothing interesting to show or talk about. There’s all sorts of great stuff in the Documents Vault: old county and city records, newspapers, maps, books, magazines, postcards, letters, posters, albums, scrap books, photographs, certificates, and diaries, to name just a few of the types of items stored in the Documents Vault. However, many of the items stored in the vault are paper-based documents that are at risk to deterioration from light, heat, humidity, acids in the paper, plastics, adhesives, other objects, pollutants, pests, and improper or repeated handling. The key to preserving these types of objects is to store them in a windowless, acid-free, temperature and humidity controlled, pest-free environment. 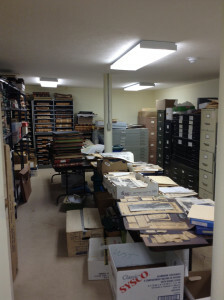 The Wayne County Historical Society, at one point in time, had two rooms where they tried to provide the proper environmental and protection controls for documents storage: the Dix Vault and the Warner Vault. However, when the tunnel running underneath some of the campus buildings was built, the Dix Vault became a breezeway to the tunnel and all the items stored in the Dix Vault had to be moved. There simply was not enough room in the Warner Vault, located in the basement of the 1874 Schoolhouse, to hold everything. The area was expanded and the present, Parker Documents Vault, was built around and envelopes the Warner Vault providing more space for documents storage. The Documents Vault is named in honor of Ethel Parker, a long-time member, volunteer, and benefactor who was in charge of the Documents Vault and acquiring items for it for decades. For years the Documents Vault has been overwhelmed by cubic feet of filing cabinets crammed full of newspapers, clippings, manuscripts and papers; linear feet of shelves holding broken and sagging books; and banks of flat file drawers overflowing with drawings, prints, and maps. Volunteers have spent hours trying to preserve and sort through the mass of documents and freshly donated boxes of items stuffed full of all sorts of paper-based documents. They try to organize the items by either subject, person, or type, so they can be found and made available to anyone doing research or interested in seeing a particular item. Recently, in addition to sorting, the focus of the department has moved toward providing better preservation techniques for the overstressed documents. Some of the items in the Vault were in poor condition when they were donated and were stored “as is” for years. The departments is now starting to try and stabilize these items and select more appropriate enclosures to house and help preserve the life of these items. For instance, there were 116 glass plate negatives laying flat in an old open-top Bauman Orchard box sitting on a shelf since they were donated in 1989 in which many of the negatives had no protective envelope. After receiving another donation in 2012 that included about another 100 glass plate negatives of various sizes something had to be done to improve the storage technique of the glass plate negatives in the Vault. The department purchased three specifically designed acid-free boxes for the glass plate negatives and hand-made a number of four-flap envelopes for the numerous non-standard sized negatives and transferred them into the new boxes. Additionally, all the glass plate negatives were digitized, cataloged, and uploaded into the Wayne County Historical Society’s online Digital Collection so anybody can see the images captured on the glass plate negatives which greatly reduces the need to handle the original items going forward. In addition, we can easily print digital reproductions of the images captured on the 100+year old glass plate negatives that can be sold to benefit the Society. 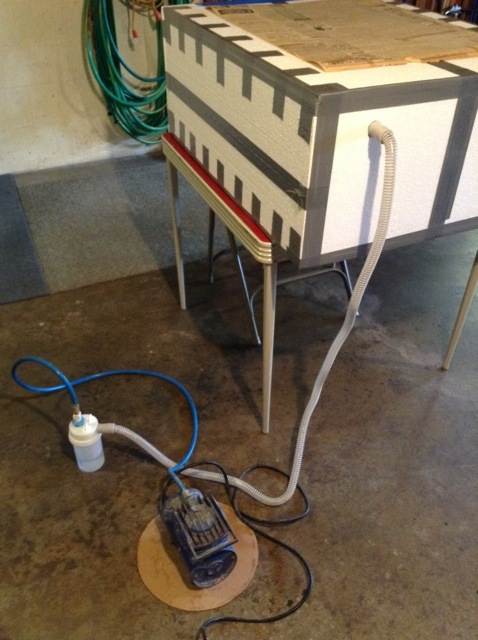 The back of the DIY Humidity Chamber box showing the nebulizer bottle and compressor used to provide humidification. Another ongoing project is to unroll and flatten documents that were either donated in the rolled-up position or were stored in the rolled position due to space constraints. When paper objects have been stored rolled for many years they become quite brittle, begin to crease, crack and tear, and eventually fall apart. Furthermore, any time somebody attempts to unroll the document to look at it, more damage is inflicted from trying to force it open and lay flat and it inevitably rolls back up. In order to safely unroll a rolled-up document moisture needs to be restored to the document through humidification which causes the fibers in the document to relax and relieves the tendency to curl. 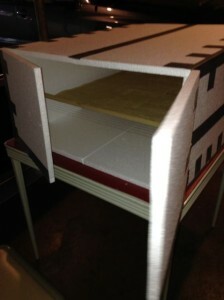 Since the Society could not afford to buy a museum quality humidification chamber the Documents Vault volunteers, Mary Eberhart, Julie Pooler, Mary Whitman, and Susan Zimmerman looked for a solution to the problem and found directions online to build one yourself from the Derry & Raphoe Diocesan Library. Front of humidity box showing a document inside the box that has begun to relax, unroll, and flatten after being humidified. For less than $10, Zimmerman was able to build a functional humidity chamber from styro-foam insulation panels, toothpicks, duct tape, and fishing line for a shelf. To fill the box with humidity, she re-purposed a piece of old horse racing medical equipment that had been gathering dust in her garage since giving up professional racehorse training years ago: a nebulizer that was originally used to deliver medication to a racehorse via an aerosol generated by a small compressor forcing air into a nebulizer bottle filled with a liquid. A racehorse would breathe in the medication vapor after it traveled through a hose fitted to a bucket that the horse wears over its nose. 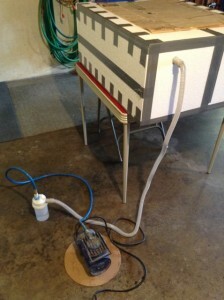 Zimmerman removed the bucket and ran the hose from the nebulizer bottle into the upper right corner of the styro-foam box, places a rolled document on the shelf inside the box, seals the box shut with tape, then fills the nebulizer bottle with distilled water, flips on the compressor, and the water is delivered as an aerosol to the box and the humidity inside the box rises. You don’t have to run the compressor long for the box to fill with humidity. Once the humidity levels rises to a sufficient level you switch off the compressor and let the document sit in the sealed humidified box for about an hour or more, depending on the thickness and dryness of the document, until it begins to relax. You can tell when it’s done by feel. It gets a bit heavier as it absorbs the water from the air and it becomes pliable. If it does not easily unroll in your hands after being humidified, it needs little more time in the box. Once a document is properly humidified it is laid out flat on a piece of blotting paper on top of cardboard and another piece of cardboard is laid over top of it and weighted down. Once it dries under the cardboard to the room’s humidity level the document can be returned to a drawer where it will now lay flat and can be safely handled, viewed, and preserved for years to come. Since getting the humidity chamber built and operating at the end of June 2014, Zimmerman has flattened just over 100 rolled-up documents that include diplomas, maps, newspapers, panorama photographs, and posters. Many of these items have not been seen for years and have been digitized and made available online. There’s still alot of work to be done in the Documents Vault; none of which could be done without the support of the society’s benefactors, membership, and dedicated volunteers. Now you know what goes on behind that closed door of the Documents Vault.